What are the possible Vetmedin side effects, and what should you watch for if the vet has prescribed this medication for your dog? This medicine is used to treat congestive heart failure, and there are a number of possible side effects that can occur with this treatment. 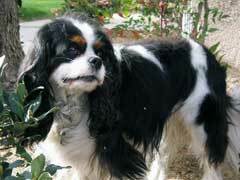 Vetmedin for dogs can help improve the quality and length of life for dogs that have specific types of congestive heart failure, and some of the possible side effects are not severe enough to stop using the drug while others are extremely serious and require emergency medical attention for your pet. The possible Vetmedin side effects can affect almost any system, and can cause many different symptoms. If your vet has prescribed Vetmedin then there is a serious medical condition being treated. Dog heart murmur symptoms, congestive heart failure, and other circulatory problems related to heart function can be very serious, and may require medication. Without this medication your dog could die sooner, but some of the possible side effects can also cause death to occur. An allergic reaction is one of the possible Vetmedin side effects that can be fatal if not treated immediately after the symptoms appear. Another side effect that should be checked out by a vet as soon as possible is a sick dog vomiting, especially if there is any blood present in the contents. Other serious Vetmedin side effects include difficulty breathing, shock, seizures, jaundice, or a pet that is unresponsive, aggressive, or seems confused. Less serious side effects do not require you to stop the medication, but you should check with your vet if any symptoms occur that worry you or seem unusual. These can include a dog not eating, diarrhea, weakness, a cough, breathing which seems labored but steady, drowsiness, and fluid accumulation in the abdomen or lungs of your pet. There are also other possible side effects, and if you are concerned over any symptom you should contact your vet for medical advice.